Broken Spoke Bike Co-op | Winter is coming! It’s that time of year again, when newspapers start getting excited about icy temperatures and wintry weather. 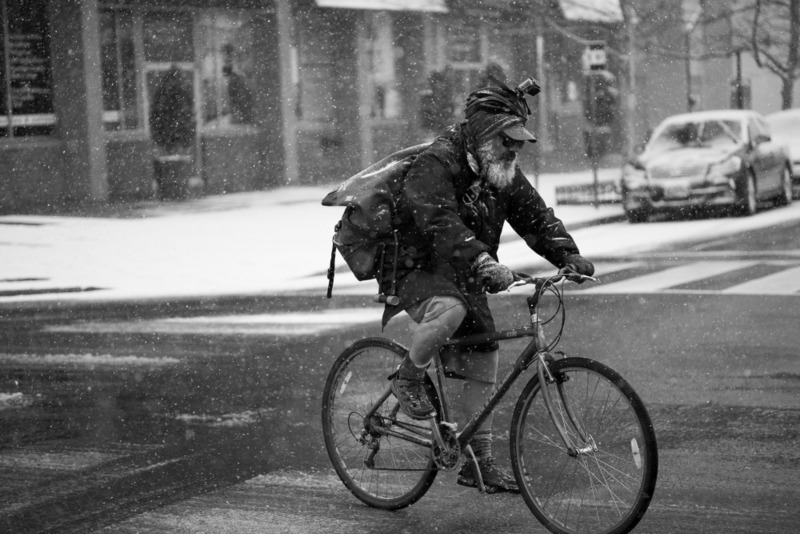 We might not have any of the white stuff, yet, but it is still worth thinking about how to keep yourself and your bike going strong through the chilly season. If you are anything like me, there are some dark mornings that you look out of the window and wonder if the bus is a better option. There is not much we can do to help with this one, other than remind you quite how wonderful the feeling of riding a bike is! If you need inspiration, have a look here. Get out there and you usually appreciate it once you’ve reached your destination. Most bikes can cope with a bit of rain, but the salt that the councils use to keep the roads clear of ice at this time of year can really eat away at a bike. Unfortunately this means that you should try to keep on top of maintenance – wash your bike as often as possible, to get that salt off, and keep your chain well oiled. Unfortunately, brake pads and cables will need replacing more often through the winter as well, so be prepared for that. Cables can also be protected from the worst of the weather by lubricating them. Not sure how to do this? Why not take one of Broken Spoke’s Bike Mechanics 101 courses? If your bike has room for them, it is often worth fitting wider tyres – many ‘winter’ tyres are often more puncture resistant as well. It’s also worth checking that your tyres are not too worn this can make them less grippy and invite punctures – if you don’t know what ‘too worn’ looks like, then pop into the Broken Spoke workshop! Winter conditions – whether that’s rain, ice or even snow – can make things slippy, and its always worth taking extra care. Take corners nice and slowly, and watch out especially for manhole covers or even road markings, which could cause you to loose grip. Be aware that it takes you longer to stop in the wet as well! In wet conditions, and especially with the generally gloomy skies that winter brings, it’s also important to ride assertively – don’t stick near the side of the road where you are less visible and where debris and slush builds up – instead ride at least 50cm from the side of the road, and on the approach to junctions consider riding in the centre of the lane where you are clearly visible. For more information on riding assertively, why not book yourself onto one of Broken Spoke’s Cycle Training courses – no matter how experienced you are, the course can be tailored to you! The evenings are drawing in.. So don’t forget your lights!